My house is over 30 years old and someone added a 2nd story sunroom supported by steel posts about 25 years ago. In the last 10 years, it settled ½ inch on 2 sides. The window wouldn’t open and was worried about continuing settlement. I called 4 companies and Anglin’s was my last call. The first, Champion, builds sunrooms. They sent out a rep but he said they don’t do repairs, only build and he recommended a foundation repair company. The 2nd had a phone listed in Atlanta and in another part of the state. The Atlanta number was disconnected and the guy that answered the other number said that he would do the work in wood but not steel. 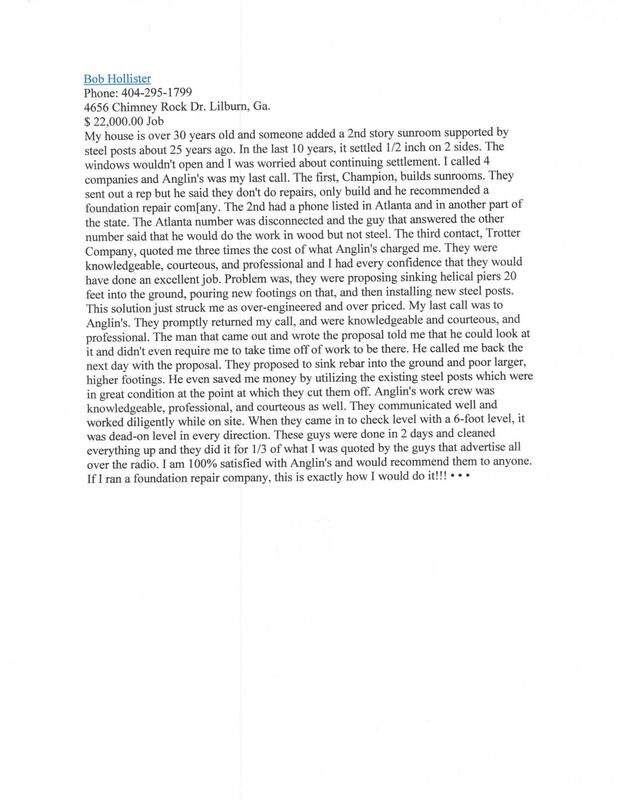 The third contact, Trotter Company, quoted me three times the cost of what Anglin’s charged me. They were knowledgeable, courteous, and professional and I had every confidence that they would have done an excellent job. Problem was, they were proposing sinking helical piers 20 feet into the ground, pouring new footings on that, and then installing new steel posts. This solution just struck me as over-engineered and overpriced. My last call was to Anglin’s. They promptly return my call, and were knowledgeable and courteous, and professional. The man that came out and wrote the proposal told me that he could look at it and didn’t even require me to take time off of work to be there. He called me back the next day with the proposal. They proposed to sink rebar into the ground and poor larger, higher footings. He even saved me money by utilizing the existing steel posts which were in great condition at the point at which they cut them off. Anglin’s work crew was knowledgeable, professional, and courteous as well. The communicated well and worked diligently while on site. When they came in to check level with a 6-foot level, it was dead-on level in every direction. These guys were done in 2 days and cleaned everything up and they did it for 1/3 of what I was quoted by the guys that advertise all over the radio. I am 100 % satisfied with Anglin’s and would recommend them to anyone. If I ran a foundation repair company, this is exactly how I would do it!! !